The month of February was an enlivening one with the early arrival of spring and two exciting festivals. As the last signs of the meager snow which fell during the winter months slowly disappeared from New Vraja Dhama’s vast fields, the warm weather started to slowly but surely creep in. At first, we were not sure if we should be overjoyed by the signs of an early spring, fearing that winter might sneak back in to give its grand finale. However, as the warming days and nights showed their persistence we were relieved to accept the arrival of the blooming and seeding season. The oxen, shaking their sleepy limbs could already be seen out on the fields seeding our first hay fields, making it an official early start for this year’s agricultural endeavors. Lord Nityanada’s Appearance Day was celebrated right in the middle of the month and was a day abundant with activities. The day started with a breathtaking darshan of their Lordships with Lord Nityananda making His entry while the roaring kirtan was at its peek. A special class discussing the particular attributes and pastimes of the Lord followed that, while outside the temple building a team of oxen was being prepared for the day’s next adventure. A group of enthusiastic devotees, children and adults alike, followed Sri Govardhana Lal as He made his way to the ox-drawn cart waiting at the bottom of the steps leading to the temple. With some sitting on the cart and others following on foot we set off on a special Harinama, chanting and dancing down the streets of the small and peaceful village of Somogyvamos. Stopping by a couple of houses on the way and distributing sweets to passersby, the Harinama at last returned to the temple where the devotees were able to partake in the special prasadam feast awaiting them. After a short break, bhajans started again in the temple room greeting the local devotees who came to attend the second part of the festival. Slowly but surely, children aged 3 to 12 arrived at the temple all dressed up in their costumes of choice. 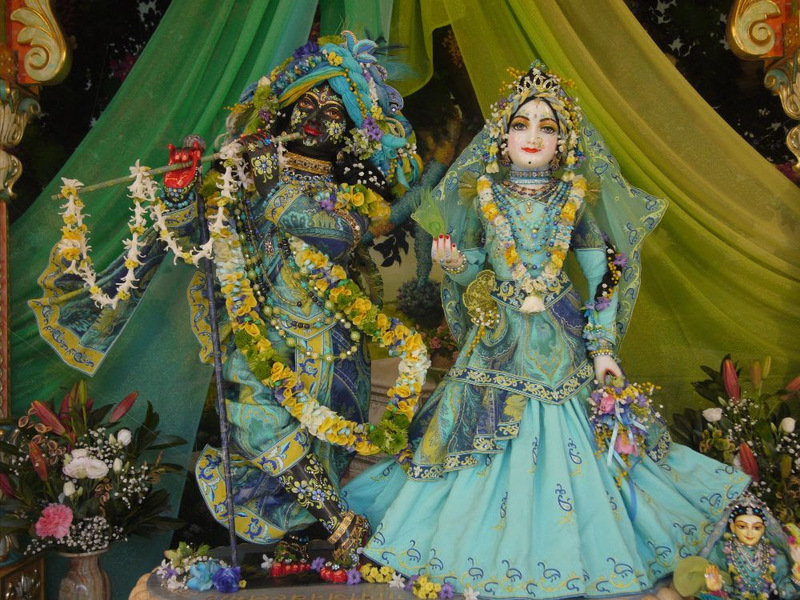 There were children dressed up as Lord Visnu, Maya devi, Gaura Nitai, Kalpa Vriksha tree and much more. It was extremely sweet to see the children entering the temple room stopping in front of the Deities and Srila Prabhupada as they demonstrated their costumes to them. The day ended with a magnificent Gaura Arati kirtan, a great ending for a wonderful day. The month concluded with our Bhakti-phalam-kirti festival. This year is the second time we organized such an event for the pleasure of Sri Sri Radha-Syamasundara. During the program the various farm departments came up to present the various achievements of 2018. Selected members of each department received generous gifts for their outstanding and inspiring services. It was enlivening to hear all that has been accomplished and heartwarming to see the great devotion in which the NVD devotees engage in their services. 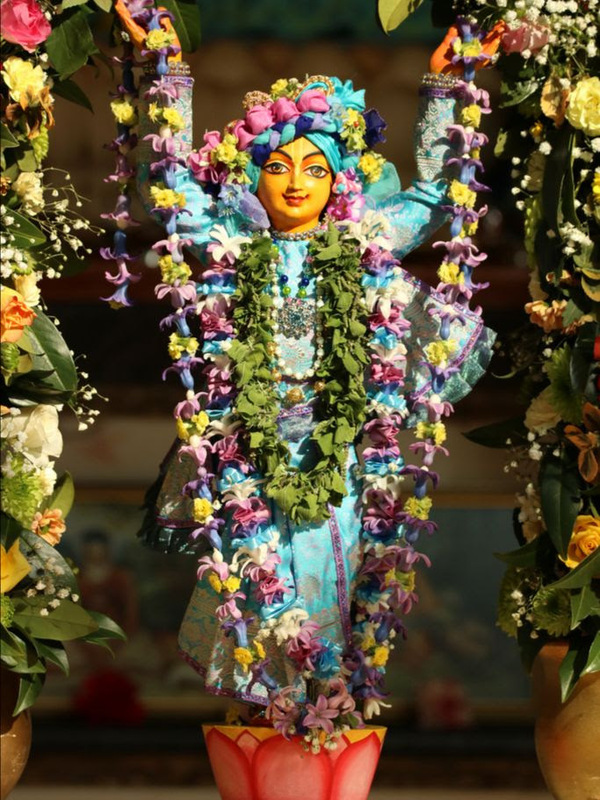 During the month of February three more donors joined the Nitya Seva project by offering their generous donations to Sri Sri Radha-Syama and Sri Sri Gaura-Nitai. One of these donations was made by a congregational member on behalf of her deceased grandmother. She felt that the only thing she could do to honor and say her last goodbyes to her grandmother was by making sure she did whatever she could to help her grandmother’s soul as it continues its journey to its next and unknown destination. What greater benediction could there be than donating some of her grandmother’s inheritance to the worship of Their Lordships? It is sure that by making this small gesture, her grandmother’s soul will reap the highest and most desired benefits. We thank all those who joined the group of Nitya Seva donors during this month and look forward to those who will join us in March. 1st, 2nd, 8th, 9th, 14th, 16th, 17th, 19th, 20th, 24th, 26th.